Here’s another update of some of the latest mods that are tickling our fancy and floating our boats. Today, we look at Doom 3’s Last Man Standing, which promises demons oozing through every orifice. Horror sense tingling? Read on. HL2 mods are popping up all over the place, but luckily, we've done all the gruntwork and have found the cream of the crop. This week, we look at E-Force, an ambitious mod that looks to combine roleplaying elements with realistic tactical combat. We recently scored an exclusive interview with the lead designer of the Star Trek Online massively-multiplayer game -- and we were full of questions for him about this long talked-about project. Our own Gareth Von Kallenbach talks Trek with Glen Dahlgren of Perpetual Entertainment to find out what lies beyond Trek gaming’s final frontier. Brothers in Arms: Road to Hill 30 is one of our top anticipated games of 2005 not only for it's amazing single player, but also for it's unique multiplayer mode. Developer Gearbox putting an emphasis on differentiating BIA's multiplayer experience from that of other world war 2 deathmatch modes. We're working on a feature to spotlight the greatest PC Games ever released. What are your personal picks on the best PC Games you've played and why? 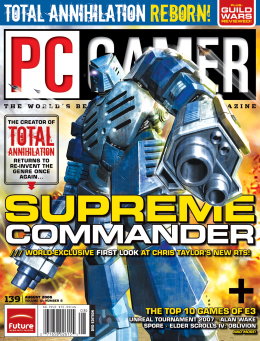 Let us know your choices for the best PC Games of all time, and you might see your opinion in an upcoming issue! Pop quiz: What was the big story at this year’s Electronic Entertainment Expo? We all know the answer, right? It’s Xbox 360, isn’t it? Isn’t that what we were told on countless infotainment spots on CNN, network newscasts, and Entertainment Tonight? Isn’t that what Frodo said on MTV?